Immunogen: Recombinant human Caspase-7 protein (full length). Formulation: Liquid. In PBS, pH 7.2, containing 10mM sodium phosphate, 50mM sodium chloride, and 0.1mM PMSF. 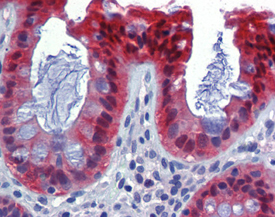 IHC Analysis: Human colon tissue stained with Caspase-7, mAb (10-1-62) at 10µg/ml. 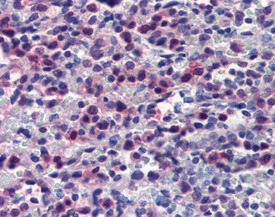 IHC Analysis: Human spleen tissue stained with Caspase-7, mAb (10-1-62) at 10µg/ml.